Three Orchard Productions, 9780996931366, 314pp. 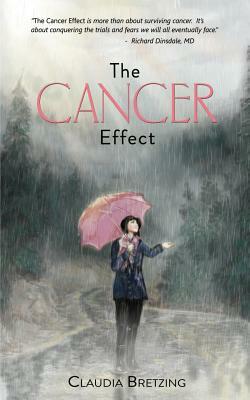 The Cancer Effect is the story of Claudia Bretzing's tender and ultimately triumphant journey to conquer the physical and emotional challenges of breast cancer. She writes of her attempts to navigate the bumps, twists, and turns characteristic of the cancer road, beginning with her unexpected diagnosis, through treatment and the resulting side effects. Claudia shares the eventual need to come face to face with her emotions when she discovers the cancer road extends miles beyond her first vision of the journey. She narrates how debilitating fear and addiction can be, how important the support of friends and family were to her survival, and how she learned to trust in God and her own body again. A captivating story teller, Claudia pulls the reader into her world, mixing the reality of cancer with moments of humor and self-discovery. "The Cancer Effect is more than about surviving cancer. It's about conquering the trials and fears we all eventually face," said Richard Dinsdale, MD. Rich in detail, Claudia's heartfelt memoir will bring tears, laughter, hope, and courage to anyone facing a cancer diagnosis as well as those who travel the cancer road with them. It is an inspiring story of the celebration of life, love, family, and the power of faith and prayer. Claudia has enjoyed writing since her youth, composing short stories, memoirs, and poems at her leisure. Her passion has competed with a myriad of other interests such as reading, playing the violin, sewing, teaching school, and raising six children. These experiences, along with living in Europe and scattered states throughout the country, have brought insights and heart to her writing. Now settled in her home state of Arizona and with her children grown, Claudia finds more quiet moments to write. She still craves time with her children and 17 grandchildren, traveling to visit them in four different states with Randy, her sweetheart of 44 years. She enjoys visiting historical sites and browsing through antique stores she finds along the way. Her enthusiasm for all holidays, especially the Christmas season, is hard to match. An optimist and a survivor, Claudia values every day, living life to the fullest and finding joy in the simple things.